A while back I found this old paperwork, still in its original envelope, sent by King's of Oxford Limited. The dealership featured here, despite the Oxford connection, was in fact their north-western showroom, situated on Chester Rd in Stretford. It was posted to a Mr. Mattok, who lived in nearby Salford. 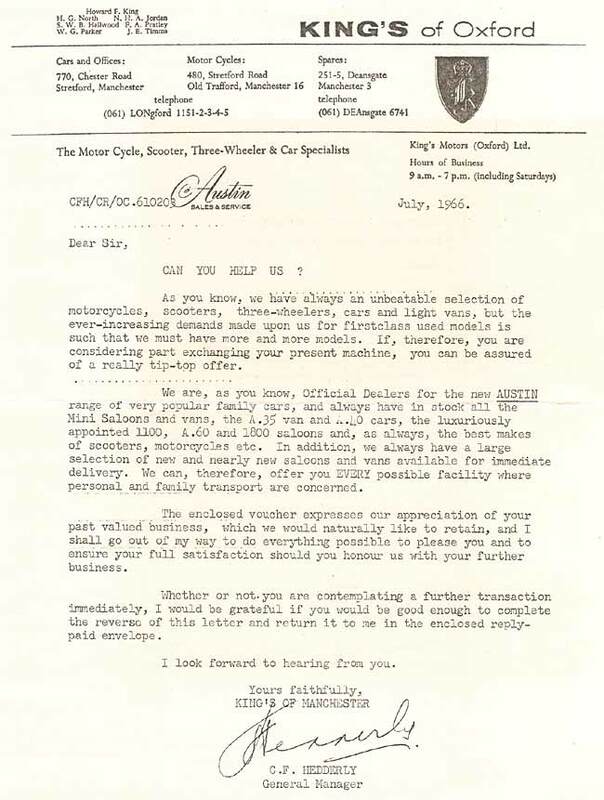 Evidently Mr. M had purchased a car from King's Motors in the past, and was being contacted again to see if he'd be interested in part-exchanging his existing car for a brand new, shiny, Austin motorcar. Also on this page, an interesting story about the Managing Director of King's, and a certain motorcycle racer by the name of Mike Hailwood. As you know, we have always an unbeatable selection of motorcycles, scooters, three-wheelers, cars and light vans, but the ever-increasing demands made upon us for firstclass used models is such that we must have more and more models. If, therefore, you are considering part exchanging your present machine, you can be assured of a really tip-top offer. We are, as you know, Official Dealers for the new AUSTIN range of very popular family cars, and always have in stock all the Mini saloons and vans, the A35 van and A40 cars, the luxuriously appointed 1100, A60 and 1800 saloons and, as always, the best makes of scooters, motorcycles etc. In addition, we always have a large selection of new and nearly new saloons and vans available for immediate delivery. We can, therefore, offer you EVERY possible facility where personal and family transport are concerned. The enclosed voucher expresses our appreciation of your past valued business, which we would naturally like to retain, and I shall go out of my way to do everything possible to please you and to ensure your full satisfaction should you honour us with your further business. Whether or not you are contemplating a further transaction immediately, I would be grateful if you would be good enough to complete the reverse of this letter and return it to me in the enclosed reply-paid envelope. 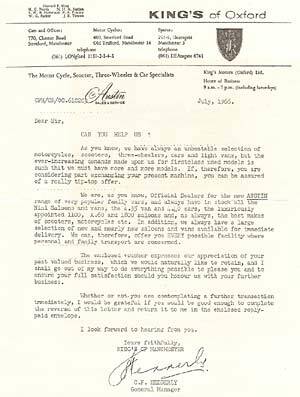 This letter was sent 13th July 1966 to Mr Mattok, but it would seem he was in no mood to change his present 'machine' (car or motorcycle I wonder? ), as he never did fill out the brief form on the reverse of this letter, or send it back in the supplied pre-paid envelope. Which is good news, because it means this tiny little chunk of motor history, from the 1960s, is preserved in its entirety. £10 upon the purchase of a new or used motorcycle, three wheeler or car costing not less than £400. For some reason, the customer's name was never filled out on the voucher - "The above named holder of this token shall have the benefit of every facility available at any King's Branch and the part-exchange value of his present vehicle shall be increased as indicated against the purchase of any other new or used motorcycle, three-wheeler or car from our stock". No "Valid until...." date has been added either. I wonder if the pre-paid envelope would still get through the Royal Mail ok now? doubt it. Curiously the franked envelope has the old 3D (3 pence) franking, that featured 'GR', or George Regina (the former King), whereas Queen Elizabeth II had been on the throne since the 50s. 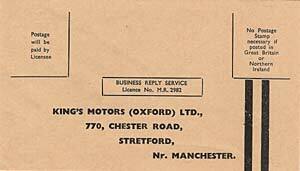 Did King's Motors (Oxford) Ltd keep their old franking to maintain their name's association with a male Royal? A quick perusal of the worldwide web suggests that King's (Manchester) is still at 770 Chester Road, Stretford. A couple of websites advise that King's now sell Chrysler and Jeep vehicles, as opposed to Austins of England, whereas other online directories suggest that the site is now used by Bentley Manchester (see www.bentleymanchester.com), which looks more likely. A quick look at the Bentley Manchester website shows a stylish showroom that could well date back to the 1930s, judging by the style of the building, so maybe the directories suggesting a Chrysler-Jeep dealership at this location are out of date now? if anyone can clarify this, I'd appreciate it thanks. More on Mr. C. Hedderly. Andrew dropped me a note in 2009, with some more information on the gent mentioned in the letter above..
"C. Hedderly was a Mr. Carl Hedderly who used to live on Cumnor Hill, Oxford in the 50's and early 60's. He was the postal manager for Kings of Oxford in Park End Street, Oxford. His job was to send motorcycles out to customers by train, having received a postal request and deposit from someone replying to King's many adverts in the motorcycling press. He also had an office at Oxford Station when some machines were returned as 'not wanted' and these were sent out to other buyers in due course. Park End Street in Oxford was a 'Mecca' for motorcycle people with Kings of Oxford, Temples, Laytons, Vines and Andrew French Motors, all selling motorcycles in the period up to approx 1965. The whole road would be lined up with motorcycles in echelon down both sides, literally hundreds of motorcycles. The 1950's being the absolute pinnacle for sales. Without a doubt, Kings of Oxford were the 'Tesco' of motorcycle retailing in those days with branches just about everywhere. Kings of Oxford gradually stopped selling motorcycles and turned their attention to cars, this is when Mr. Hedderly must have moved to Manchester. Hope this is of interest." Thanks for sending me the information, much appreciated! The story behind King's of Oxford. Update. Some time ago an account of King's of Oxford, and its links with motorcycle racer Mike Hailwood, was sent over by a forum member and added to this page. I later discovered that it wasn't entirely accurate, so what follows is the true story behind the formation of this company, as told by the founder's son, Gerald King. "Before joining up to fight in the First World War in 1914 my father was an early motorcycle enthusiast, so when he went to the Somme he became a dispatch rider in the Royal Engineers. In 1916 an entirely new weapon arrived on the Somme, the army tank. Because of his experience and engineering qualifications, he became a commander of one of the first tanks on the battlefield and he was Mentioned in Dispatches for his bravery. After the war ended in 1918 he joined his father's removals business for about two years, during which time he sold his old motor bike and bought a better one and did a few similar transactions before starting his own business in 1920 employing one mechanic, with my father buying and selling machines himself. One day a man called Stan Hailwood hobbled into his yard and asked if he had any work because he would like to sell motorbikes but my father said he didn't really need anyone because he did all the buying and selling himself. However, Stan Hailwood suggested that perhaps he could have a trial period of two weeks with my father for no wages but having a commission on each sale. He was so successful that my father decided to employ him, although he felt that there would be a problem because he had at some time broken his leg which had not been properly re-set making walking very difficult for him. My father took to Stan Hailwood and at my father's expense sent him to an orthopedic surgeon to have his leg properly re-set, the result being a great improvement although one leg was always slightly shorter than the other. When Stan returned to work as the Salesman, my father devoted his time to buying motorcycles all over the country and the business became so successful that my father built a magnificent showroom and offices in Park End Street, Oxford which became the headquarters of the company and the first branch was established in Birmingham in the 1930's. In 1935 Kings Motors Oxford Ltd was successfully floated on the London Stock Exchange which was an amazing achievement because much of the world was still suffering from the great depression which started in 1929 with the Wall Street Crash. In 1939 with the outbreak of World War 2 the business was virtually mothballed and premises used for storage by the Government. 1946 saw the start of considerable expansion in the business with nearly 50 branches in England, Wales and Scotland which included the takeover of Raymond Way Motors in London and some car dealerships. In the post war years my father promoted Stan Hailwood to General Manager then Managing Director with my father as Chairman, eventually becoming President of the company when he was in his late 70's. In the 1970's an entrepreneur spotted that the underlying property values in the company were far greater than that reflected in the current share price so he made an offer to all shareholders which was accepted and sadly he closed down most of the branches and sold the freeholds with staff being made redundant. This process later became known as 'asset stripping'. Stan's son Mike Hailwood was never involved in Kings Motors, but became famous in motorcycle racing."